On the road to the 'Goldfish Aquascape' I've learned that goldfish and aquascape don't really flow in perfect harmony. So, for my first challenge I'm going to make this work by designing an aquascape for them (and me, of course). Now that I've assessed the issues my last post, what could be my potential design elements? Although my fish are near and dear to my heart, their size, clumsiness, and natural digging behaviors are obtrusive to any intensely planted tank. Tasty tender leaves... yum, open salad bar. Delicate root growth... gettin' dug up. Intricate wood and rock characteristic... poppin' off scales and rippin' fins. Sleek substrate slope... we thought you'd like mounds of dirt. Oh, why am I plagued with this dilemma!?!? In order to enjoy my aquascape and my goldfish there has to be a balance. To tell you the truth, it sure doesn't look like they are going to compromise. If you're anything like me, you don't feel like pushing all the aquasoil back only to wake up the next morning to it being ruined again. You hate replanting only to see those same plants floating around getting nibbled on. You spot missing scales and take full blame because you know they can't handle swimming well, especially with sharp rocks around. It looks like I'll be going with a minimalistic aquascape that agrees with the goldfish. The best approach seems to be one that involves little to no hardscape, simple plants that can take a beating, and sectioned off soil from sand. For the hardscape I'm thinking a mild mound (or island, don't know yet) that is position off center. In the mound I'll have a well of aquasoil surrounded by black sand. I'll make a boundary with local dark river rocks to keep the sand and aquasoil separate. With the separation, I'm hoping that the fish won't mess with the soil. Who am I kidding? You know they will, they're goldfish. Nevertheless, we'll see. I'm going to use plants that I already have. Who has time for buying new plants, cleaning, etc... Plus the plants I have are perfect for a goldfish aquascape, in my opinion. They grow like wild fire. So, any nibbling will be combated with veracious growth and will in turn block the substrate from the fish. See that, knocking out two birds with one stone. The fullness of the spatterdock leaves makes it an extraordinary background plant. The striking color of the tiger lotus makes it a great plant to use as a focal point. The banana plant's low lying leaves make is a good foreground plant for the goldfish aquascape. This plant looks awesome as a background plant when grown to its full glory. The leaves have a ruffled arrowed shaped appearance that elongates the space bringing the eye up and through its mesmerizing waves. I love to get visually lost in this plant and so do the fish. 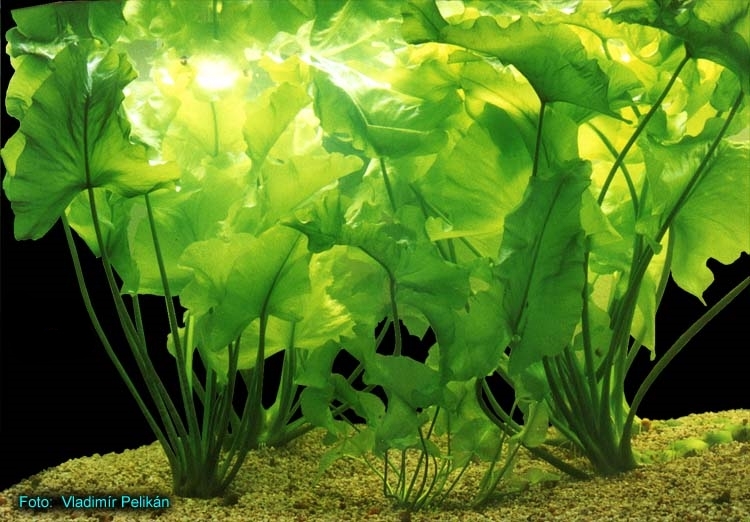 It is dense enough to keep them away from the substrate but the leaves thin enough to allow them to swim through. This plant has striking rust color that gives it a textured appearance. I prefer this plant pruned low to allow the leaves to compact into a small bush. If allowed to grow it can become very bushy but if clipped accordingly it can form step ladder leaves up to the surface. My fish love navigate through the tendrils of the lily pads. The span of the lily pads elongates the tank by bring the eye across the tank. Unlike the other two plants I have, the banana plant has low lying leaves that grow in a tight rosette. Its greeness and waviness complements the spatterdock but sometimes it turn red along the leaf veins tying in the tiger lotus, too. With all that said nothing is set in stone until the scape goes down. So, please subscribe and continue reading The Greener Side to see how this aquascape and others are created.